The advice given here is only an introduction and general in nature. Every dog is an individual and if you feel that you need more help. Please contact me and I will be only too happy to discuss your issues. In my experience addressing issues earlier rather than latter leads to better results. Prevention is better than cure. 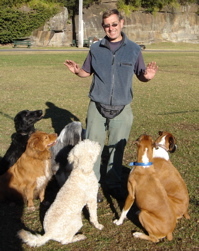 I believe taking a proactive approach to your dog's health saves you money and promotes a long healthy life. I favour taking a more natural approach to health issues and trying to solve the problem without the use of antibiotics and drugs. Having a good relationship with your vet is important and I would always refer to the vet if the problem persisted for a couple of days. The remedies in this section are a result of experiences and issues that I have dealt with over the years. It is by no means definitive. Diet is a huge issue I believe and have devoted a whole section to it. I try and take a holistic approach to dog health using more natural remedies in conjunction with our vets advice. Disclaimer: The tips here are general advice only and if you are at all concerned about the problem please seek professional advice straight away. 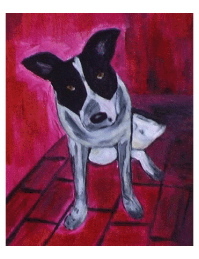 Susannah did this painting of our dog Gus on the first day he left the pound. Unfortunately, he had a poor puppy hood which manifested in him becoming a very anxious adult dog. Anxiety can be played out in forms of behaviour and physical symptoms like obsessive scratching, barking, hiding, panting and more. It is very important to try and address these issues before they become a problem. One of my dogs was quite edgy and he would wind himself up very quickly. He was a rescue dog who had been confined to a backyard for his first couple of years and so every new experience was over exciting. We tried using a Thundershirt (see left). The change was quite miraculous. As soon as we put it on he calmed immediately and he started yawning, indicating that he was relaxing. Overall his behaviour has improved immensely. 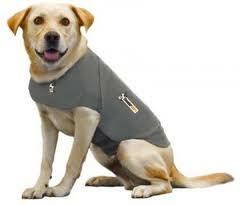 The shirt is easy to fit and doesn't restrict the dog's movements. At some time in its life your dog might get a wound or a cut. Around Sydney Harbour oyster shells are particularly nasty and can become infected quickly. It is important to do something straight away before the wound becomes infected. 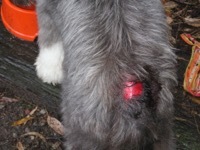 If it is a deep wound I would recommend consulting your vet straight away. 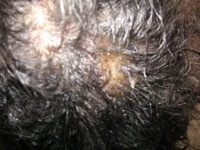 If stitches are required the best results are achieved if done immediately. For lighter wounds I try and clean the area with a mild antiseptic like tea tree oil, then dress the wound with a non stick absorbent pad and then wrap with a breathable crepe bandage. Check regularly to make sure the bandage is clean and the wound is not bleeding or infected. Mutt-Luk dog shoes (shown right) are great for keeping bandages on the feet clean and taking the pressure off the wound when walking the dog while it is healing. I always have a couple of pairs available for the dogs I walk. Our old dog Millie was part Staffy and skin issues were always a part of her life. Problems tended to arise in the hot warmer weather or if she has been playing in the bush or dirty water. Wandering Jew (shown right) is particularly prevalent in Sydney and causes many nasty rashes. If it is in your garden get rid of it with a Glyphosate weed killer. Longer haired dogs like retrievers and spaniels are more susceptible to 'hot spots' from scratching itches with dirty claws and then the wound becoming infected. Because they are difficult to see under the thick coat they can quickly become a very nasty sore requiring medical treatment. For minor irritations we use a solution of 50/50 apple cider vinegar and water and dab with cotton wool to the itchy area. If the area is very red and sore I would not hesitate taking Wilbur to the vet. A pharmacist friend of mine recommended a couple of human ointments that could be used for dogs if you don't have other treatments available. If the condition persists be sure to see your vet. Eurax cream has an anti parasitic property that is good for sea lice. It is antiseptic and anaesthetic to calm the itch. Soov Bite works for minor stings and bites like mosquitos and sandflies. Again antiseptic and anaesthetic to soothe. 1% Cortesone Cream can be used for a red angry rash that the dog won't leave alone. I would try Eurax first and if that doesn't work then try the Cortesone Cream. Paralysis ticks can be deadly to dogs and have to be monitored all year round. They are particularly bad around the Northern Beaches of Sydney where bandicoots and possums carry them. This one looks huge but really they are about the size of a match head. I insist on tick control treatments for my dogs and if they are in a particularly bad area I will use a tick collar as well. Even though I use a treatment I always check the dog as I pat them to feel for any unusual lumps or bumps. 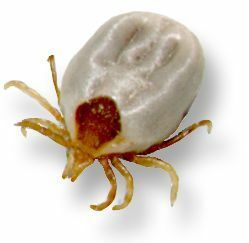 A tick needs to be on a dog for about two days before the dog starts displaying symptoms of lethargy, dull eyes, lack of appetite, hoarse or laboured breathing and then unsteadiness on feet or loss of control of the back legs. Don't hesitate get them to the vet straight away for treatment. If you find a tick squeeze a little Rid cream insecticide on them and then pull the tick head and all the body out with tweezers. The Tick Twister tick remover makes the job even easier. Fleas will normally be controlled by the tick treatment. 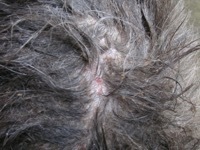 However, fleas can be become resistant to one treatment. If this happens talk to your vet about switching to another brand with a slightly different formulation. There are systemic treatments, like Bravecto or Nextgard, that the dogs take in a tasty chew and last between 1-3 months. These treatments work by killing the tick when they bite the dog and dropping off before they become engorged. 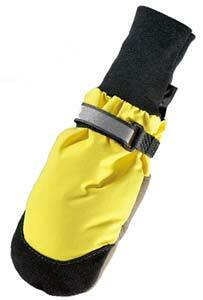 Sprains can happen quite easily with an active dog. Often rest is the best medicine and see if the condition improves in a couple of days. If the limping continues it is best to check with your vet that there isn’t another underlying problem. Wilbur I swear has Kangaroo in him and loves to jump for the ball. I am aware that if he jumps too much he will pay for it later in life, so I try and keep the ball close to the ground. Swimming would be helpful for exercising while the sprain repairs itself. Vet bills can mount up quickly if your dog gets sick or has an accident. It is worth considering taking out pet insurance especially if your annual checkups and treatments can be claimed on. Disclaimer: This information is general advice and does not represent an endorsement. Professional advice should be sought before making any decision. Obesity and weight problems have become a big issue in the dog community as well as human society. An overweight or obese dog can get many medical problems, hip and back pain, lethargy which all help contribute to a shorter less fulfilling life for the animal. Dogs respond quickly to a reduction in food, so first try reducing the amount the dog is eating. Skipping one or two meals can see them come quickly back into shape. 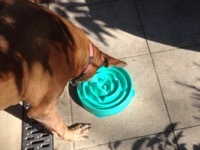 We use a puzzle bowl to slow up greedy eaters. Please see your vet if you are having problems controlling the dogs weight. I have had a number of dogs who have lost weight quickly by using the calorie controlled foods. Do not feed your dog onion,sultanas, tomato leaves or chocolate because these can be poisonous to dogs. Changing diet should be done gradually over a couple of weeks. Introduce 10-20% of the new food and then increase over the following days until the new food makes up the whole diet. Changing the diet too quickly can result in an upset tummy. There are an enormous variety of dog foods available and it is important to get one that suits your dog and your budget. In the processed and prepared foods I tend to find that cost is a good indicator of the quality of the food. I am not a great fan of dry food but if this suits your dog, I would recommend Grain Free dry food because some of the cereals that are used to fill out the dry food can cause itches and a yeast build up that may lead to hot spots and ear infections. The vets tend to stock the premium brands. I have found that the premium brand poos tend to be easier and cleaner to pick up. I feed Wilbur a raw diet which he does very well on. My Barf recipe is shown and I have seen many dogs health improve on this diet. Dr B’s Barf and Big Dog Barf are two commercially available raw foods that are very convenient if making your own doesn’t appeal. Probiotics can help improve the gut flora aiding the digestion of the raw food. 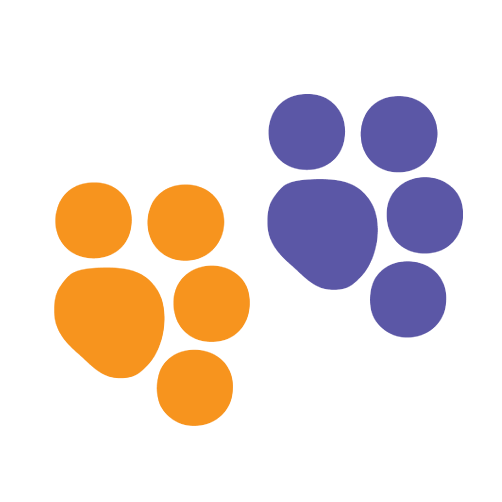 We use Blackmores' PAW Probiotic which is available at Pet Stores. We have also used Dr Mercola's Dog Probiotic which is available online. Wilbur gets a mixture of prepared food, vegetables, rice and fresh meaty bones to keep his teeth clean, breath fresh and coat healthy. I always check their stools when picking them up to get a good indication of how their body is coping with their diet. This diet is called a BARF diet and there are many recipes on the internet. When changing any diet phase the food in over 2 weeks and using a dog probiotic can help the gut adjust. Finely chop Vegetables, Fruit and Eggs in food processor. Mix Molasses, Seaweed Powder, Apple Cider Vinegar and Flaxseed meal into mixture and then combine with raw pet mince. All ingredients are raw and finely chopped to help the dog absorb the nutrients. Keeping extra weight off older dogs is the best thing you can do for their joints and arthritis. They naturally slow up and so don't need quite as much food as when they were young. As dogs get older their tolerance for fatty foods can diminish. A blander diet can be easier to process. Natural anti inflammatories like fish oil, green lip mussel, rose hip and glucosamine can help with aches and pains associated with arthritis. These supplements can take a while to start being effective. Dogs react differently to these supplements and if one doesn’t suit your dog I would recommend trying an alternative. 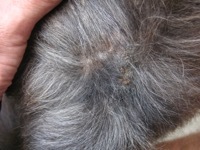 Allow several weeks to allow the treatment to build up and improve the condition. The best check of your dogs health is checking their poos everyday. You will notice changes from time to time. Most problems are fleeting. However, if the change lasts more than a couple of days it is worth investigating further. Healthy poo should be firm and easy to pick up. A white mucus in the poo generally means that it has come from the upper bowl and there has been an upset. Blood in the poo is something to watch. If it is a minor gut issue it can correct itself in a day or two, If it persists please get it checked out. Slippery Elm powder mixed with water and added to the dog's food can help if there are digestion problems. It is soothing on the gut and can help ease constipation.